From classics like "The Tortoise and the Hare" and "The Grasshopper and the Ants" to obscure gems like "The Frogs Who Desired a King," Fable Comics has something to offer every reader. Twenty-eight fables from different cultures and traditions are wonderfully adapted and illustrated in comics format by twenty-six different cartoonists. Edited by New York Times bestselling From classics like "The Tortoise and the Hare" and "The Grasshopper and the Ants" to obscure gems like "The Frogs Who Desired a King," Fable Comics has something to offer every reader. 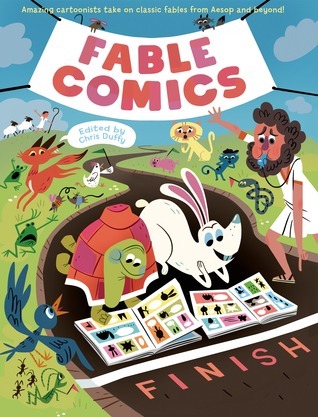 Twenty-eight fables from different cultures and traditions are wonderfully adapted and illustrated in comics format by twenty-six different cartoonists. Edited by New York Times bestselling Fairy Tale Comics' Chris Duffy, this jacketed hardcover is a beautiful gift and an instant classic.